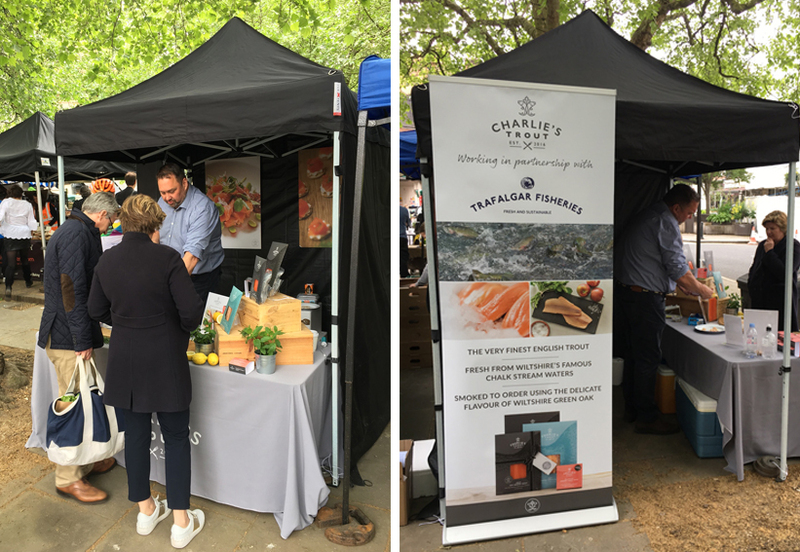 Charlie’s Trout joins the London Farmers’ Market family. On Saturday Charlie set up our first stall at the bustling Pimlico Road London Farmers’ Market. After a very early start, the market opened at 9am sharp and had plenty of enthusiastic tasters and customers, all keen to try out and buy our hot and cold smoked trout and award-winning smoked trout paté. Pimlico Road Farmers’ Market features a wonderful array of producers, from florists to fruit farms to fresh (and smoked) fish. The area is thoroughly picturesque and the farmers’ market is set up in a leafy square - so we think well worth a visit, even if you’re not a local. Stock up on some interesting shopping, enjoy a coffee and a leisurely wander and come and see us on the Charlie’s Trout stall. We’ll be there on every 2nd and 4th Saturday of the month. Just head to Orange Square on the corner of Pimlico Rd & Edbury St, London SW1W.